SoHi Principal Tony Graham fields questions about potential consolidation with Soldotna Prep. The Kenai Peninsula Borough School District is holding meetings across the Peninsula to gauge public opinion on different options to consolidate or close schools in the face of expected budget cuts. At a public meeting this week, district officials discussed the possible consolidation of Soldotna Prep into Soldotna High School, putting freshmen through seniors back in the same building for the first time since 2014. Most of the 60 or so people who came to the SoHi auditorium Thursday night were current 8th graders and their parents, wondering how to plan for next fall. There are a lot of moving parts to shuttering Soldotna Prep, which also houses students in River City Academy along with special needs students, and integrating them back into the high school. But it could represent a savings in excess of $600,000 or, roughly six full time teaching positions. 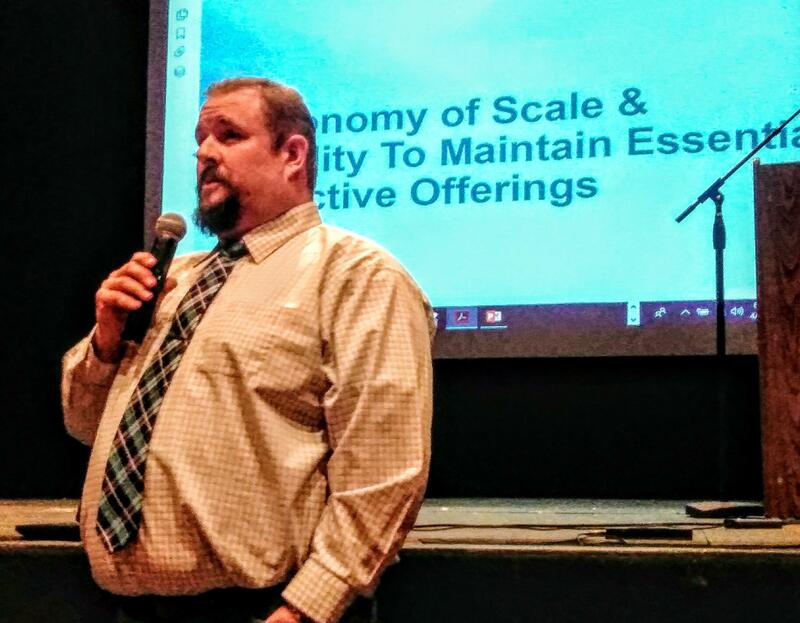 Soldotna Prep principal Curt Schmidt said one of the goals in consolidation would be continued class offerings that might go away if staff were cut in order to keep the building open. SoHi principal Tony Graham said under the best scenario for his building, they’ll still lose at least one teacher and be looking at increased class sizes, but potentially fewer class offerings. Now, some of that has to do with declining enrollment. It’s not all because of the budget. But consolidation might be a way to keep offering courses beyond just the basics. It’s likely there will be more public meetings before any final decisions are made, but school board member Dan Castimore said given a range of a lot of bad options for the district to choose from, this one is more appealing than closing the only school in an Anchor Point or a Moose Pass. One parent in attendance asked, given the budget situation, what parents can do. Assistant Superintendent John O’Brien had a clear answer. In the short term, O’Brien suggested continued calls to legislators. A key part of Governor Mike Duleavy’s long term budget vision includes fundamental changes in how the legislature is allowed to appropriate money. The governor has proposed three constitutional amendments, and this week, began a roadshow hoping to drum up support.